Do you want a hearty but romantic meal that doesn't require slaving over the stove in the evening? This crock pot beef stew for two recipe takes only some prep work in the morning and then you can enjoy the meal stress-free in the evening. Beef stew is a great meal to make in the crock pot but most recipes make enough for the whole family. If you're just cooking for two people or just yourself, you may want a recipe that doesn't produce several leftover servings. The recipe uses lean beef round or lean chuck, along with vegetables and herbs. 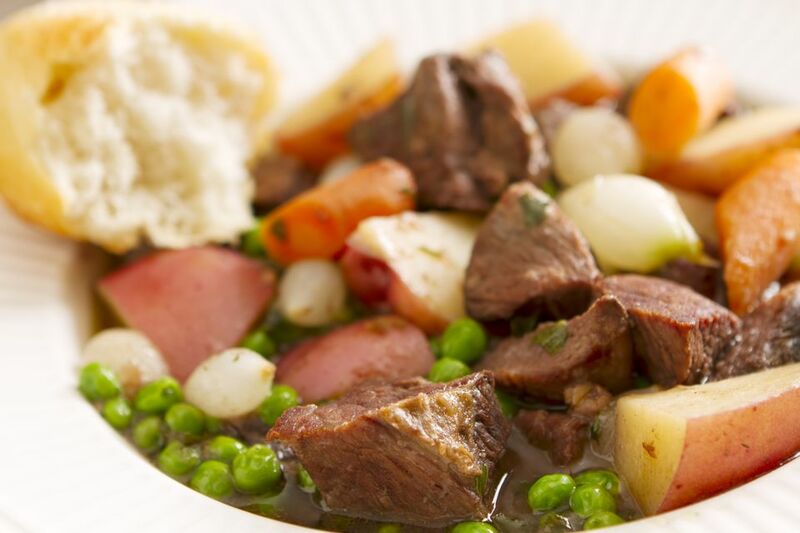 This beef stew can be the center of a romantic meal with a green salad as the first course, and crusty rolls or a baguette to soak up more of the stew. Red wine pairs very well with beef stew. Think of something chocolate for dessert. If you are cooking for a larger group, you can double the recipe. You'll be amazed at how easy it is to make this hearty dish. Coat the stew meat with 3 tablespoons of flour. Brown the meat in a skillet with vegetable oil until the meat is quite dark but not burned. The color on the outside will give color to the stew broth as well as add flavor from the browning process. Drain the browned meat well. Add the meat to slow cooker with the vegetables, spices and enough water to cover the ingredients. Cover and cook on low for 6 to 8 hours. Don't worry, it can cook longer if your day is longer. During the last 30 minutes of cooking, remove the bay leaf and turn the heat setting to high. When the stew is boiling, stir in a mixture of 2 tablespoons of flour and about 1/2 cup of water. Cook until slightly thickened. You can refrigerate any leftovers and they will reheat easily in the microwave. Leftovers can also be frozen to enjoy weeks later. You can use any vegetables you like for this stew. Make it with frozen mixed vegetables instead of the carrots and potatoes.